There is power in giving–of your time, your energy, your expertise and your money–and it’s been proven over and over that the more one gives, the happier and more fulfilled a person feels. According to an article about the Science of Giving Back in Forbes.com, studies link having purpose and doing good for others with better sleep, cognitive benefits, longer life and even beneficial changes to a person’s gene expression! The problem is that we often get stuck in our daily tasks, or we become overwhelmed with the need we see around us, or we feel that we don’t have the resources to make a significant difference. To choose from the endless number of causes that deserve our limited time and resources is paralyzing. Instead of committing to a cause that has meaning to us, we get to the edge of the gigantic abyss of organizations trying to change the world for the better, peek over the edge and then quietly start inching away until we’re back in a familiar territory of work projects, headlines and friends’ news feeds. This is where giving circles come in. The concept of giving circles is not new, in fact, many people may be part of one without actually knowing the official terminology. 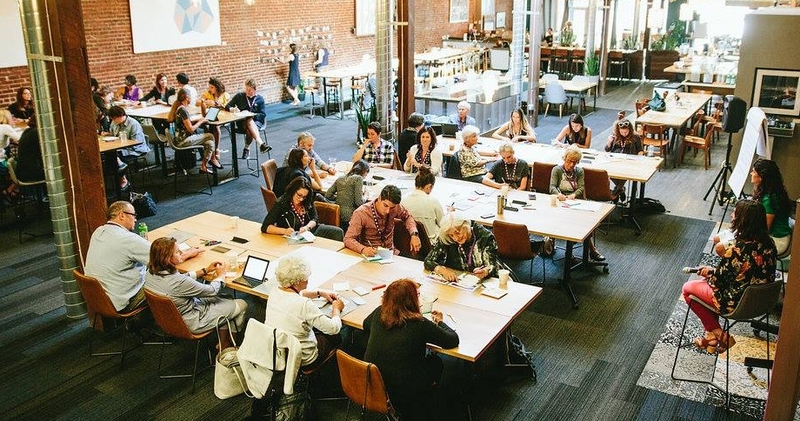 Recently, I was fortunate to attend Amplifier’s West Coast Convening—a full day focused on how to bring people with shared values and interests together to amplify their potential for positive impact. I’m delighted to share a little about the event–which was fabulous–and some of what I learned in the hopes that it’s valuable to my network and encourages more people to connect their communities and their values in order to strengthen their giving power. What is your "North Star" when it comes to giving? Not only was this a great way to quickly bond with the other people in the group by learning what they prioritized when it came to social action, it was also empowering to know that through teamwork, we were able to give to an organization that we felt was truly deserving (and would use the money effectively) and we were able to give more significantly than would be possible otherwise. Throughout the day, I couldn’t help but compare Shalon to a Giving Circle. When I created Shalon to bring people of all backgrounds together for moderated conversation over a great meal, my goal was for these events to be a catalyst for community, learning and advocacy. By connecting people with others, with information and with opportunities to get involved and to give, Shalon has become a path towards action that allows people to come to the table without feeling overwhelmed by the onslaught of information and philanthropic organizations vying for their attention, time and money. Although each of the many sessions throughout this jam-packed day was valuable, as I walked home, I found myself focused on a concept shared by Hali Lee, founder of the Asian Women Giving Circle and Mario Lugay, founder of the technology platform Giving Side. They urged each of us to find our personal “North Star” which would help define how and when we give, who we give with and to whom our resources are allocated. During their session, I defined my North Star as “sustained advocacy for inclusion and justice through connection, learning and giving.” I love the concept of targeting a far-flung objective and being able to set milestones for success along the way. I was encouraged by the accomplishments in their communities and felt confident that through my passion, the community I am building through Shalon and the network I’ve created of like-minded organizations, I will be able to inspire others to get involved, to educate themselves and to give in whatever way works best for them—despite the fact, that Shalon is not a giving circle, at least not yet!